Buick has added some exciting cars and crossovers the last few years, but we think they hit a home run with the new Regal GS. We ended a week behind the wheel agreeing that this is a car we?d like to have in our garage. The design is striking with it?s sweeping roofline, sculptured side panels, clean rear fascia and the sporty front end. 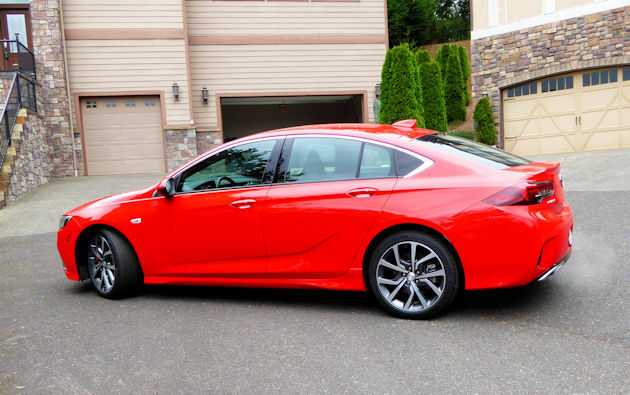 Buick has changed the traditional sedan configuration to a four-door hatchback, which Buick calls Sportback. 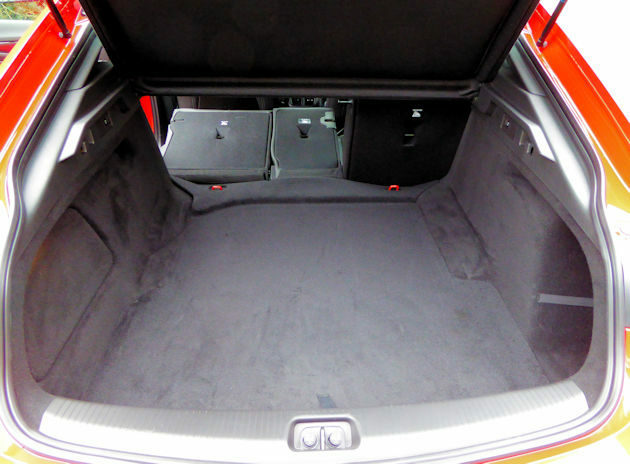 We like a hatchback because it allows the rear seats to be folded to expand the potential cargo space dramatically and without the rear window shelf. With the wide opening you can load a large amount of cargo into that space?if you wanted to. And with the 40/20/40 rear seat split you can expand that space as necessary without having to eliminate all the rear seat passenger capacity. 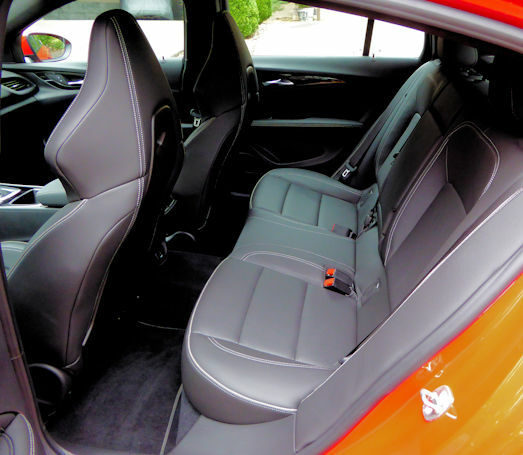 The front seats are impressive with their racy-looking headrest, excellent support and high degree of adjustments. The front seats are AGR-certified ? that?s a prestigious rating from a German company that tests comfort and support of car seats. Did we mention that they also heat, cool and massage? The dash and controls are traditional with an easy-to-read three pod instrument panel and large high-mounted touch screen for the infotainment system. The center section is an eight-inch reconfigurable performance cluster where you customize vehicle functions and readouts in front of the steering wheel. There is also an available multicolor Head-Up Display to display vital information on the lower section of the windshield. Buick planners even provide real turn knobs for controls like climate and audio volume and large buttons for other often used controls. Other infotainment controls are made from easy to see and read icons on the large infotainment screen mounted at the top of the center stack. Each icon had a large graphic and the name of the control, making the adjusting quicker so you didn?t have to look away from the road for long. ?This is a sport sedan designed for everyday driving, but one that makes every drive special,? said Duncan Aldred, vice president, Global Buick and GMC. ?The new Regal GS is in the sweet spot of the market: more refined and luxurious than the mainstream, more value for the price with style and premium features on par with higher-end competitors, and with standard features like AWD with active twin clutch and a rear sportback design that will surprise customers with its usefulness.? 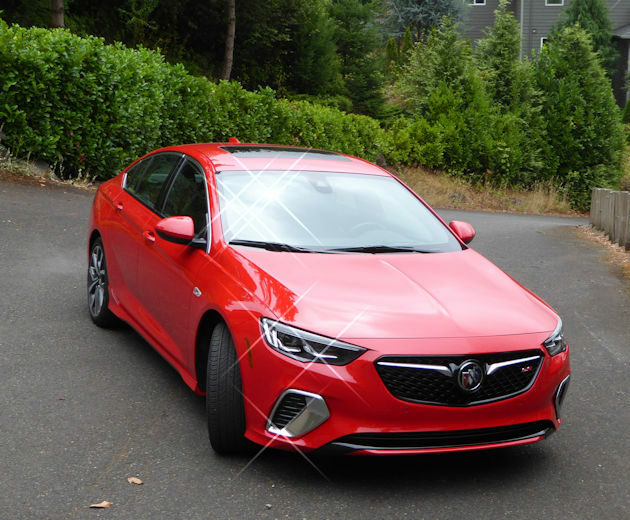 The 2018 Regal is the sixth generation and is a world car with strong ties to the Opel and Vauxhall Insignia sold in Europe and the Holden ZB Commodore in Australia. It is also a popular model in China. What really set this GS apart from the other Regals is what comes with the GS designation. Earlier versions of the GS were powered by a turbocharged four-cylinder engine. 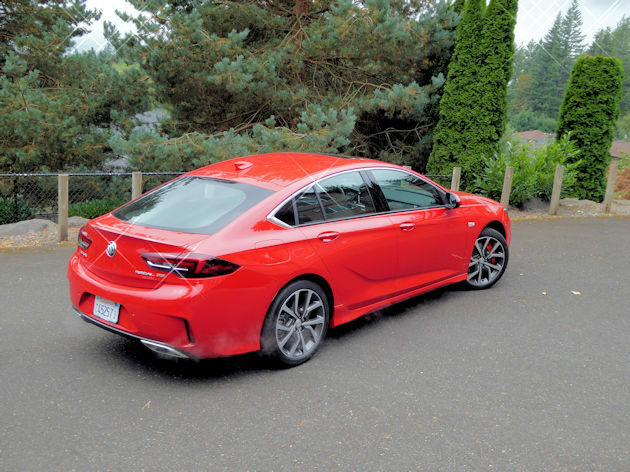 Our test car was powered by Buick?s 310-hp 3.6-liter V6 engine driving all four wheels running through a nine-speed automatic transmission. The naturally aspirated powertrain is refined and smooth plus the exhaust note produces a powerful soundscape to enhance the driving experience. Buff magazine testing has the obligatory 0 to 60 mph acceleration run taking as little as 5.4 seconds. That puts the GS in the same league as sports coupe like the BMW 328i and Audi A4. The EPA lists the Regal GS fuel economy at 19 mpg city, 27 mpg highway and 22 mpg combined. 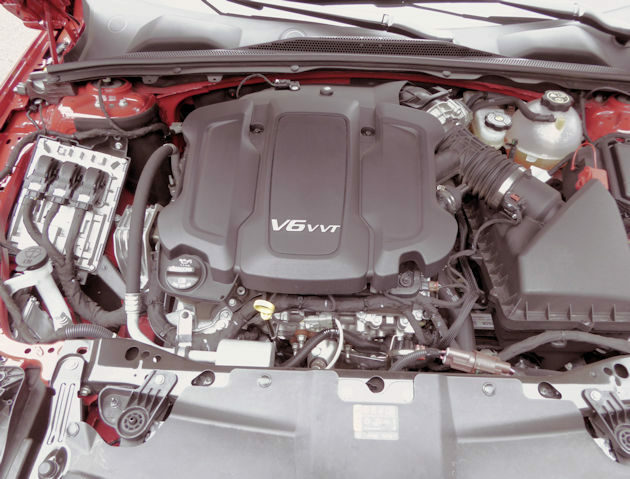 The engine has a smooth and seamless start/stop system to help boost the mileage. We averaged 24.9 mpg during a week of normal highway/city driving. Okay, we did do a few acceleration runs, but only to merge with the fast-moving traffic. With its abundant power, and fast shifting nine-speed automatic transmission we expected to feel shift paddles hidden behind the steering wheel ? but, of course, there were none. We had to do manual shifting with the console mounted shifter. 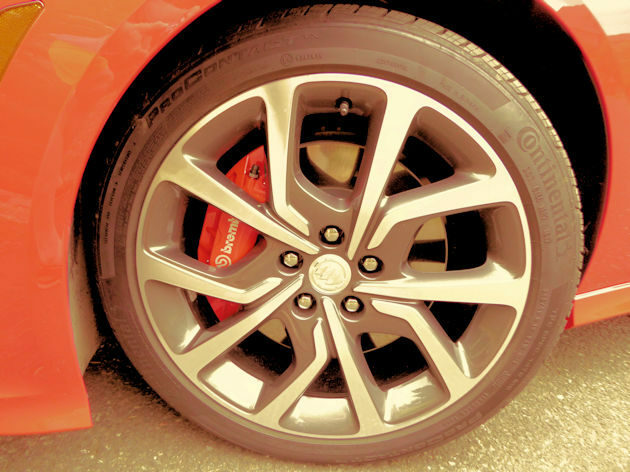 The AWD system uses an active twin clutch to transfer torque between rear wheels for more efficient performance. 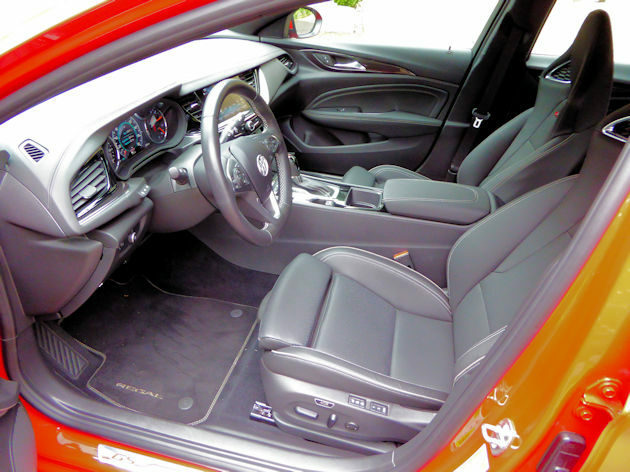 Every Regal GS has Buick?s Interactive Drive Control, allowing the driver to tailor the car?s dynamics by selecting a setting on the center console. Interactive Drive Control utilizes Buick?s second-generation Continuous Damping Control, which adjusts suspension damping up to 500 times per second. And we can?t forget to mention that the GS has Brembo brakes in the front for quick solid stopping power. 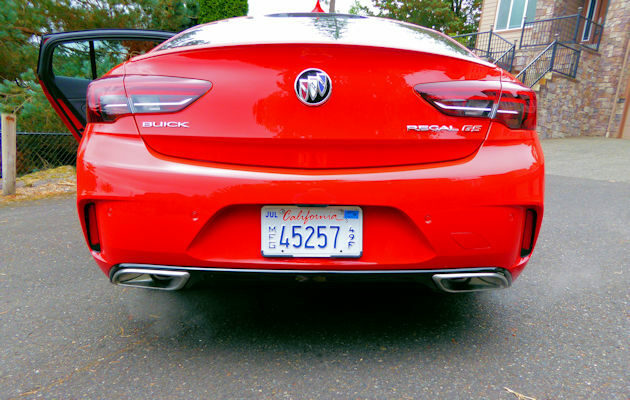 ?With the all-new 2018 Regal GS, we set out to make a driver-focused, engaging and entertaining sport sedan without sacrificing the smooth ride and refined character expected of any modern Buick,? said Martin Hayes, chief engineer for the Buick Regal GS. ?Our new V-6 and nine-speed transmission, intelligent AWD and CDC all work to deliver excellent driving performance.? The GS utilizes most of the features we look for when evaluating a car for our personal use. That includes features like blind spot detection, all-wheel drive, heated seats, heated steering wheel, rear cross traffic alert, hi-beam control on the headlights and the available active cruise system. Other GS features include front and rear park assist, Active Noise Cancelation, sport suspension, 19-inch aluminum wheels, acoustic glass with solar absorbing treatment, heated driver-side outside mirror, memory seating, alloy sports pedals, flat bottomed steering wheel, in-vehicle air ionizer, lane change alert, manual thigh support for both front seats, power seat back bolsters and leather seating. The 2018 Buick Regal GS AWD has a base price of $39,995 including the destination charge. Our test vehicle added the navigation package with audio upgrade, a driver convenience package (adaptive cruise, following distance indicator, forward collision assist, lane keep assist, pedestrian detection and head up display) and a power moonroof. Bottom line price is a reasonable $44,115. Other Regal Sportbacks start as low as $25,995, but we think the extra money for the GS is a good investment in driving enjoyment.